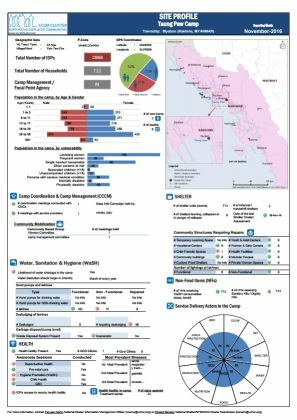 This document presents the results of the CCCM Site Profile carried out in the following sites: Taung Paw Camp (Myebon, Rakhine); Ah Nauk Ywe Camp (Pauktaw, Rakhine); Baw Du Pha 1 Camp (Sittwe, Rakhine); and Thet Kae Pyin Camp (Sittwe, Rakhine). 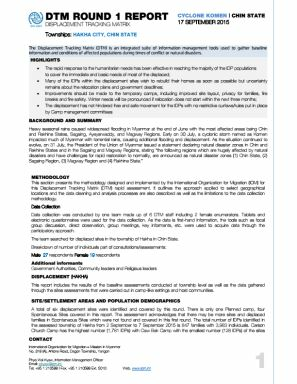 During the reporting period, DTM recorded a total of eight displacement sites (addition of two sites in Sagaing state since last round) and 1,374 IDP households. 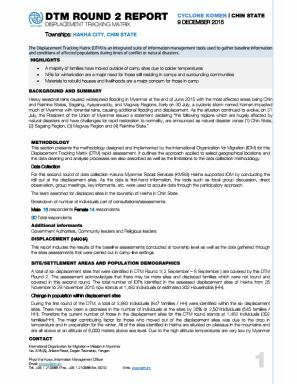 During the reporting period, DTM recorded a total of six displacement sites and 1,482 IDPs (302 households). 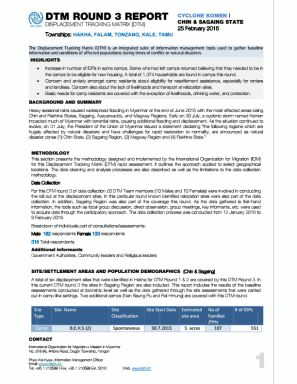 Mostly because of a drop in temperatures and the relatively elevated location of the sites, there has been a 35% decrease in IDPs (2,501 individuals or 545 families) since the last round. 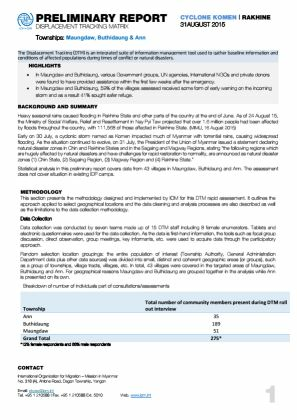 During the reporting period DTM recorded a total of six displacement sites and 3,983 IDPs (947 households). 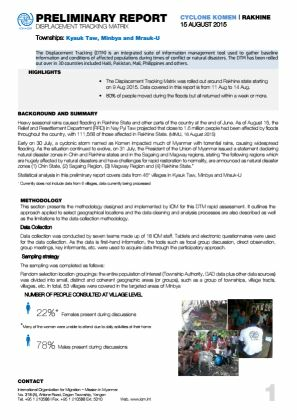 The site with the highest number of IDPs is ‘Carson Church Camp’ with 1,781 individuals. 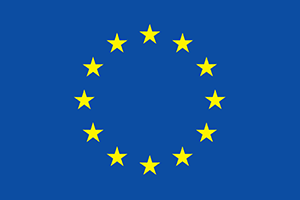 Heavy seasonal rains caused flooding in Rakhine State and other parts of the country at the end of June 2015. Heavy seasonal rains caused flooding in Rakhine State and other parts of the country at the end of June 2015. In addition, early on 30 July 2015, a cyclonic storm named as Komen impacted much of Myanmar with torrential rains, causing widespread flooding.